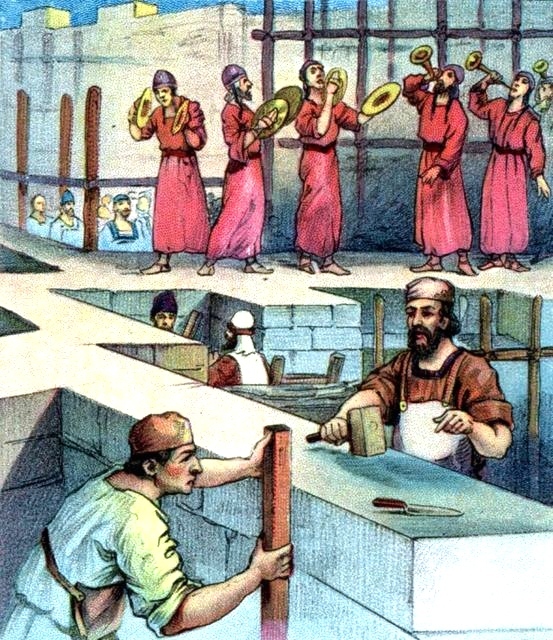 “When the builders laid the foundation of the temple of the LORD, the priests in their vestments and with trumpets, and the Levites (the sons of Asaph) with cymbals, took their places to praise the LORD, as prescribed by David king of Israel. With praise and thanksgiving they sang to the LORD: ‘He is good; his love to Israel endures forever.’ And all the people gave a great shout of praise to the LORD, because the foundation of the house of the LORD was laid” (Ezra 3:10-11). The year is 537 B.C. The place is Jerusalem. The Jews have just returned from a long captivity in Babylon. Some have been gone from their homeland for 70 years. Others have been gone for 50 years. But everything has changed. The countryside is in the hands of their enemies. The city of Jerusalem lies in ruins. The walls have been torn down and buildings have been looted. And worst of all, the temple built by Solomon 500 years earlier is no more. It’s gone. Vanished. Utterly destroyed. The temple itself was razed. 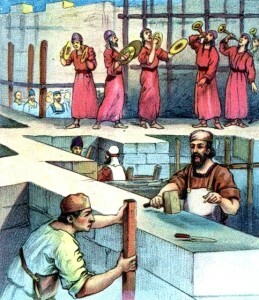 The Ark of the Covenant is gone, the altar of sacrifice is gone, and the temple implements are gone. In its place lies a field of rubble. However, in the middle of all these disappointments, the Jews found themselves praising God. This story tells us that praise is a choice, not a feeling. Should we praise God only when we feel like it? I don’t think so. We’re to praise the Lord at all times whether we feel like it or not. Many times we won’t feel like praising the Lord. That doesn’t matter. Praise isn’t about our feelings. Praise is a choice we make without regard to our feelings.” Don’t wait until the victory is won to praise the Lord. Stop and praise him before the battle is begun. Praise God in the midst of the conflict. And praise Him even when things seem to be going against us. Do what the Jews did and praise Him for a good beginning. That will put our soul in the right place to continue to work with joy in the days to come.